Mothering in a Mess – Live. Simple. Good. I wrote this post and then someone close to me told me I sounded like a depressed slob! I may not be chipper every moment of the day and I don’t have an immaculate home but I will say I am not a depressed mess! I may have gone a little overkill in my honest post because I tend to overthink things and judge myself more than I should. That being said I will update this a bit so you don’t imagine me to be some hoarder with dirty neglected children running around… hehe… so here goes! I asked my two year old at dinner, “what fun thing did you do today?” He replied, “when I went swinging with daddy the other day…” I know this doesn’t seem like a big deal but that was 5 days earlier! He had been with me for 5 whole days and only remembered doing something fun with daddy (and I’m even the one who suggested they go!). I felt so disappointed in myself. I keep waiting for my house to be clean and organized so I can finally be a fun mommy. I’ve heard countless times from older mothers… “let the laundry pile up and the dishes sit in the sink and just enjoy your children!” I understand the point of this completely but it also is the reason having a simple and tidy home matters even more to me! I want to have a joyful home for my children to grow up in but the clutter and disorganization wears on me but I cant see past the overflowing junk drawer, the table and bar covered with mail or the massive amounts of laundry that never seem to let up. the pile of laundry I need to fold that never has enough room to fit in our dresser drawers. I let my home control me instead of controlling how I want my home to be! I use this one frustrating situation to dwell on 20 things – I need to get this house in order AGAIN, I should play with my children but the laundry needs folded, I should stop eating so much so I can lose weight, if I could get this place organized I could exercise, I’m probably a disappointment to my husband, nobody likes me…. blah blah blah. It’s sounds so crazy when I write it out. Then to top it all off I end my day with the GUILT most mother’s have – forcing myself to wonder if I’m doing anything right. I start my day by sitting down on my couch – tired, discouraged and exasperated – and the day has barely begun. My response to the mornings and my level of productivity is so much influenced by how my home feels and looks. And from the moment I open my eyes in the morning I am aware of the clutter around me. I start my day tired, typical for mommys, especially when my toddler doesn’t usually wake up a “sunshine boy.” My home already annoys me and then the frustration of his 6am morning screams of protest, “I do it! I do it!” doesn’t help. I am totally fine avoiding having to wash the pans or take laundry out of the dryer to fold… the problem is I’m not leaving those tasks undone because I am sitting there enjoying my sons – instead I’m sitting on the couch AVOIDING the messes I bathe and dress my boys, feed them, pick up around the house, do some laundry but then I don’t know where to put my surplus of belongings so I sit down and Pinterest for new recipes, read a book that actually isn’t even very good or do that thing I want to do ALL the time… EATING! snack on something I shouldn’t. I want to do art with my boys but I let the stack of papers on the table win and instead I tell myself or my son, “tomorrow we will paint after I get the table cleared off.” Instead of seeing my beautiful boys who are alive and well (since I check on them 10 times before I go to bed), I see a mess that they have to play in. I know from the short amount of time I have had a de-cluttered kitchen and living room how much easier it’s been to keep it tidy. When I wake up to a clean and shiny home the first thing I want to do is unload the dishwasher and I’m ready for my next project. I want to do art. I want to do something fun with my boys. I want to plan a enjoyable evening with my hubby. And best of all I’m POSITIVE! But if I wake up to a mess I just plain give up I feel crabby and discouraged. I want to change this! I want to create a home thats easy to tidy so I have much more energy to do fun things with my boys and be more creative in my own art. 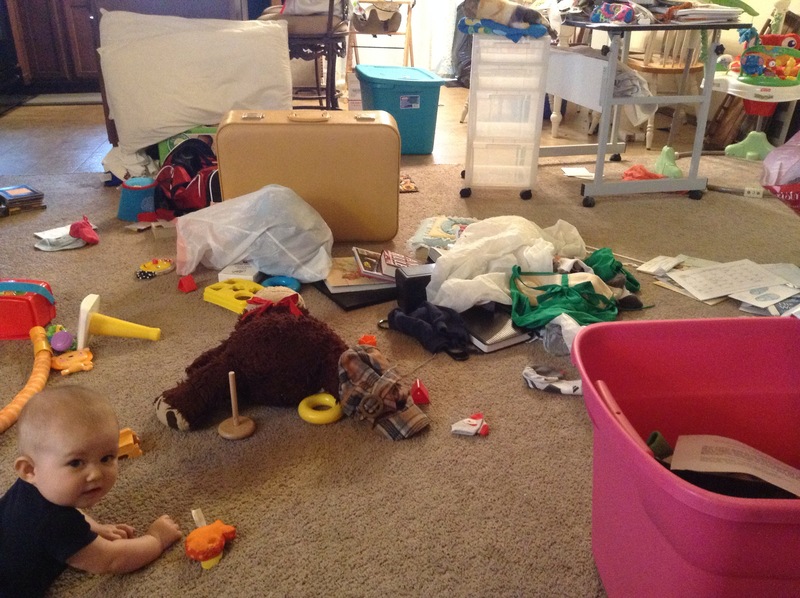 The picture is what my living room looks like as I write this post – I have been going through my bedroom and its easier to bring everything out here with my boys then have the boys in my room BUT this is NOT what my home looks like on a regular basis. In my harsh judging though its kind of how I perceive things at the end of the day. Each day is exhausting with two little boys, especially after taking them to Costco by myself. Yet I can still beat myself up for leaving a couple pans to wash the next morning even though I made a nice dinner and loaded the dishwasher all while my two year old keeps trying to jump of the couch while my baby is playing nearby. Yesterday was a good first step. Amidst a day of decluttering and trying to get my room done I was a able to pause often and enjoy little moments with my boys. I kept a happy tone because I was DOING something toward making my home a better place, making progress, not dwelling on my flaws. 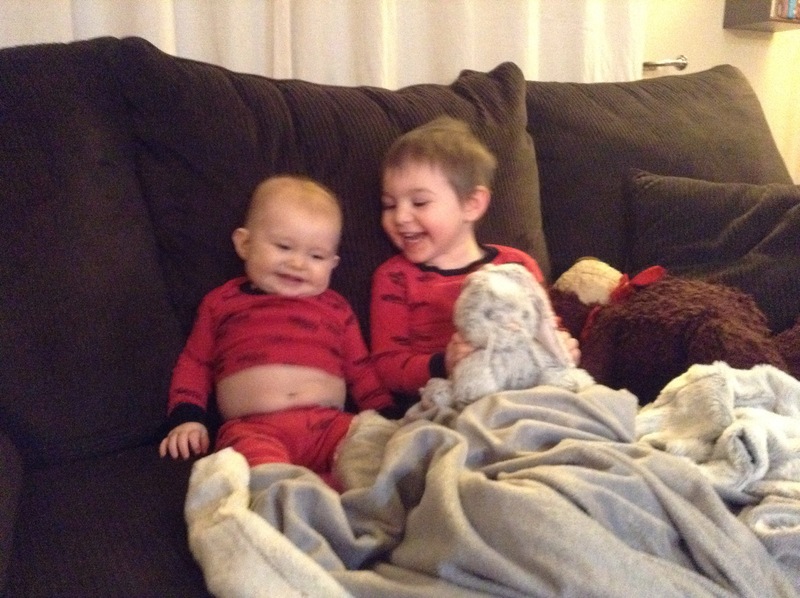 And at the end of the day I sat down (still surrounded by the mess) and had a movie night with my boys. It was the first time in a long time I went to bed with a cheerful heart and not one of guilt.